Allex Michael: Deja vu! attitude wise. Luckily, Ebbey knows the meaning of sit where ever she is, she just does it when it suits her. For the first 18 months, Ebbey also had no interest in being a good dog. Ebbey now hates getting in trouble and is quite soft. However, for the first 14 months, she would try to pull out of her leash or run away. Ebbey doesn't turn door knobs, but she was clever enough to open the fridge and got into the kitchen cupboards while we were home. Ebbey also has extensive word recognition abilities than her roommates. She is also far more cunning and independent than most dogs. Working with Ebbey as a canine actor is more time consuming than my shepherd/bouvier cross or several other mutts I have known and trained. Training was very time consuming for the first 18 months, but is now easier as she matures. OR I have come to accept her limitations. Including a very short attention span for anything she considers work. ie: obedience training or posing for the camera. Ebbey can pick up a new bad habit after only one or two repetitions. At the same time, it takes her a very long time to get used to things she dislikes. I still have a physical struggle on my hands when cutting her nails. Often walking slightly behind, Ebbey now accepts me as top dog. Just as long as there is no torture involved, like nail cutting. 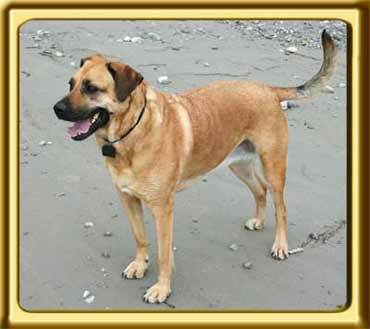 Soliciting pets from strangers, Ebbey's cross bred heritage may be influencing any ridgeback reservations. However, she reacts very differently to someone knocking at the door (tail wags) versus someone trying to break in (formidable aggression). Ebbey often reacts AFTER assessing the situation...classic ridgeback, compared to a shepherd or rottweiler that immediately barks and asks questions later. I'm not sure if this is high intelligence or confidence in her abilities or both. She also seems to instinctually recognize dangerous people and tries to keep me away from them. Consistency has tamed most of Ebbey's defiance, though she will go eat grass (allergic to) right after being asked not to. Or dig a second hole, right after being scolded while digging the first. Always supervised outside, her backyard landscaping efforts have decreased. Ebbey patrols the backyard...classic ridgeback. Though less dominant than Sophie, still takes advantage of her top dog social standing. Ebbey is also somewhat moody, though rarely bad tempered or sulky. She is mostly just sad which I try to relieve by giving her lots of affection. Unlike her Rottweiler roommate, she's never vindictive and thinks the best of everyone. Ebbey's original 'Go to hell' looks have become 'What's in this for me' or 'How can I get out of this'? Ebbey is a wary of large crowds, if and until the attention turns to her. Then when it's her job, she comes through. With relatively recent wild dog lineage, I think ridgebacks are more wild and instinctual than most dog breeds and thus harder to train. With their strong tracking instinct, may doggedly pursue a scent in spite of your obedience commands. I keep exposing Ebbey to crowds and other dogs, continuing socialization well past the normal 18 month period. Ebbey is very spoiled, which doesn't help her obedience. What seems to work well is almost whispering a command or using a soft happy baby talk. It's pathetic (people think you're nuts) and exhausting for me, but whatever works.